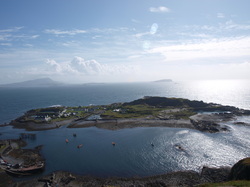 The Island of Easdale was historically a slate mining island and the remains of this industry are clearly seen on the island today. The 7 quarries still remain and are now filled with sea water following the great storm of 1881, and the last slates were mined in 1950. The majority of the 60 odd houses on the island are the original slate miners cottages. 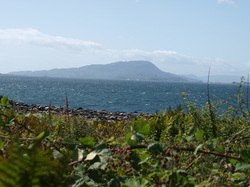 Follow the myriad of paths around the island, or climb up to the top and check out the 360 degree view. 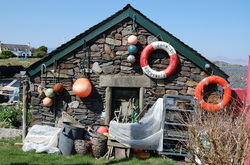 The ferry shed, where it all happens. The ferry operates every half hour- see 'location' page for details. We use wheel barrows to transport our stuff around, the wheel barrow park is by the ferry shed. 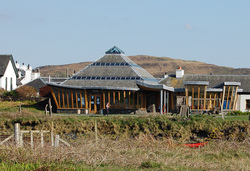 The community hall has a fantastic reputation for putting on gigs, attracting bands from the upper echelons of the folk community, aswell as theatre shows, art exhibitions and is available for private and public functions. An Lionadh is a hop, skip and a jump away from Easdale's very own pub/restaurant which has won numerous awards. No taxi home required. A play park right next to the pub keeps the nippers happy. It's a win win thing! The island is lucky enough to have it's own museum which details Easdale's history in an informative and interesting way. 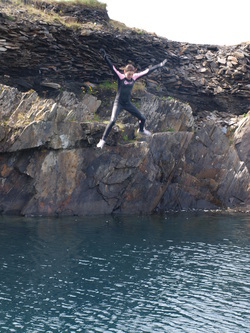 Some brave people are known to take a dip in the smallest quarry on Easdale. Beautiful clear water which shines blue!